Dr Joseph Neprarnga Gumbula on the day he received the degree of Doctor of Music (honoris causa), conferred by Sydney University Pro Chancellor, John McCarthy (Photo courtesy: Sydney University). Joseph Neparrnga Gumbula was a generous man. And coming from an influential family – his father, Tom Djawa's art is held in collections around the world - it was inevitable that he would assume a role of teacher in building a cultural understanding of Indigenous Australia. So first - but perhaps not by plan - he apprenticed as a carpenter, followed by a stint in the NT Police Force, where he received a Commendation for Bravery. Then he became a member of the rock band, Soft Sands. It had some success on the Australian music scene, but its major success, some might say, was that it paved the way for the huge achievements of the band to come - Yothu Yindi. But in his role as a leader of traditional ceremonies within his own community of Yolngu, and a master singer of Manikay, the Indigenous song tradition of NE Arnhemland, success came in directing performances at major venues - from the the Garma Festival in Arnhemland to the Cite de la Musique in Paris. It was in 2003 that he accepted a Visiting Senior Fellowship at the University of Melbourne, which gave him a chance to explore the Donald Thomson Collection of barks and artefacts from NE Arnhemland at Museum Victoria and in the Ian Potter Museum of Art. And it was during this time that he became a founder of the National Recording Project for Indigenous Performance in Australia. 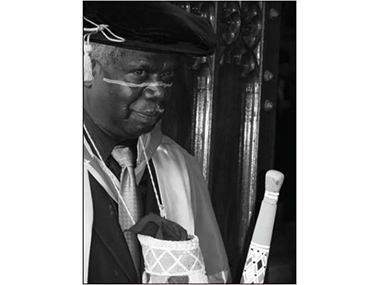 By 2007, the University of Sydney had awarded him an honorary Doctorate of Music for his contribution to cultural understanding, and as Dr Gumbula he went on to become a senior advisor on Australian Indigenous collections around the world. His 2009 exhibition, Makarr-Garma: Aboriginal Collections from a Yolngu Perspective at Sydney University, provided deeper insights into Yolngu culture than had been ever seen before. And his book, Mali' Buku-Runganmaram: Images from Milingimbi and Surrounds, 1927-1962 (2011), received a Mander Jones Award for the best interpretation of an Australian archive in an individual publication. His career spanned 44 years, and at the time of his death, Dr Gumbula was still active in working toward cross-cultural understanding. "Dr J. N. Gumbula - the honeybee man eternal. Follow the waters home and rest with the old people". Sourced from the obituary by Aaron Corn, student and co-author with Dr Gumbula.